"[P]reservation" of wild life as "game", was directly and repeatedly challenged by men living and finding their living in their own places, their own country, but now, by the arbitrariness of law, made over into criminals, into rogues, into marginal men. The demarcation of the Forest Reserves on Kilimanjaro and Meru and the prohibition of cultivation and grazing within the boundaries was probably as unpopular a thing as the government ever did in those parts. Securing control over access to, and the benefits derived from, natural resources was a critical process in the early formation of the colonial state in Tanzania. Natural resource laws were essential not only for generating revenue for the state and fueling accumulation for private interests, they were symbolically important for the assertion of the dominance of the German kaiser and later, the British Crown, over all aspects of the territory's economy and wealth. The resulting centralization of control was produced at the expense of an existing system of communal property relations and customary rights to land and resources within African societies. The purposes of this chapter are to identify the ways in which the new colonial dispensation disrupted customary practices and rights and to explore the ways in which Africans resisted these changes. Much of the chapter is based on archival sources found in Tanzania and England, with additional information from various Tanzanian government documents. 1 Relying on these sources for insight into the desires and motivations of Africans under colonial rule poses analytical challenges. Since the written history of conservation is the product of an elite social group, the voices of African peasants and pastoralists are heard here as barely audible whispers, and even those are usually relayed secondhand. These types of documents, written by state officials, have limited utility for uncovering "the silent and anonymous forms of class struggle that typify the peasantry" (Scott 1985, 36). Nonetheless, we can gain a sense of what was at stake for rural African societies by tracing some of the debates conducted within the colonial government concerning the conflicts between conservation policies and customary rights to land and resources. Occasionally, the actions of those whose land uses were threatened by conservation policies are reported in the colonial records, and these incidents hint at the existence of a rural moral economy, its constitution, and its defense. The chapter, then, examines the historical process of transference of natural resource control from the local customary institutions to the state, beginning with general patterns in the territory and moving on to the specific situation on Mount Meru. The Germans made similar efforts to control wildlife, legislating a complex set of regulations on hunting, as well as creating eighteen game reserves where all hunting was prohibited. 6 A hunting license was required to hunt most animals in the colony. Africans also had to have a game license to hunt any of the controlled species, which included common meat sources such as antelopes, buffalo, and hippo. The only animals anyone could hunt without a license were predators such as river pigs, warthogs, porcupines, ground pigs, and monkeys. World War I took its toll on the German forest bureaucracy's meticulous record-keeping efforts in German East Africa, and British natural resource professionals thus found that few of their documents remained. 7 Enough was preserved, however, for the British to use as a base on which to build their program of resource management and conservation. Regarding the draft of the first Regulations on the Conservation of Forests, the interim director advised, "I cannot do better than to refer you to the laws in existence under the German regime." The British government, he continued, "would be well advised to base its forestry laws on those of the Germans." 8 Essentially it did, immediately proclaiming all reserved forests anew as a preliminary measure. 9 In December 1920, D. K. S. Grant (previously of the Kenya Forest Service) was appointed the first conservator of forests. His primary charge upon taking office in January 1921 was the creation of a separate Forest Department based at the old German forest headquarters at Lushoto. The legal framework for administering the territory's forests was established by the 1921 Forest Ordinance, which incorporated all the previously designated German forest reserves. Gazetted forests in 1921 totaled 8,770 square kilometers, slightly less than I percent of the territory. Once the new Forest Department assessed the forests in its charge, some were decommissioned, others added. By 1925, 212 reserves covered 9,601 square kilometers, most of which were closed montane tropical forests in the highlands. The 1921 ordinance initiated a series of prohibitions for these reserves, including cutting or removing trees or forest produce, firing, squatting, grazing, and cultivating. 10 As restrictive as these rules appear, the policy was such that it did not prevent "the exercise of any right or privilege recognized by the Governor," whose officers could issue licenses for most of the prohibitions. One significant (and contentious) concession was the free use by Africans "of any forest produce taken by them for their own use only." Conservationists in England—most notably the Society for the Preservation of the Fauna of the Empire (SPFE)—found this "liberal" policy unpalatable and constantly chastised the Tanganyika government for allowing the "slaughter" of game by Africans. As an indication of the SPFE's influence, the Game Ordinance of 1940, which replaced the 1921 ordinance, was authored "to give effect to the provisions of the International Convention signed in London on the eighth day of November, 1933, in so far as those provisions relate to the preservation of fauna in its natural state." 14 The London convention resulted almost exclusively from the SPFE's efforts. The 1940 bill, however, did not significantly alter Tanganyika's game policy, with the exception that a new category of protected area, the national park, was created. 15 Contrary to what was sought by European conservationists, the wording on African hunting seemed, if anything, to more strongly recognize traditional rights: "Nothing in the foregoing provisions of this Part shall make it an offense for a native to hunt, without a license, any animal not protected under the provisions of section 24, for the purpose of supplying himself and his dependents with food, provided that he does not use arms of precision." 16 As for game reserves and national parks, certain customary rights were also confirmed in the 1940 Game Ordinance. Any "person whose place of birth or ordinary residence is within the reserve" or "who has any rights over immovable property within the reserve" could enter or reside within. Immovable property, it was ruled, included pasturage for livestock. The stage was thus set for a protracted battle between conservationists and human rights advocates over the configuration of wildlife and forest management in the colony. On one side, conservation advocates wanted the state to exercise its claim as the sole legal authority controlling natural resources to curtail any customary use by Africans. On the other side were pro-African elements who argued that the League of Nations mandate obligated Britain to respect African rights to the greatest degree. The result was a policy of compromise: not a compromise between the state and the colonized African population, but between factions within European society, and one that was ultimately unworkable given the ideological chasm dividing the two sides. The legal ambivalence of colonial policy and legislation allowed both African rights and conservation advocates alike to make convincing arguments about the validity or irrelevance of African customary claims to land and resources. Very early in the British occupation, Sir Donald Cameron, governor of Tanganyika from 1925 to 1931, foresaw the opposition of pro-African officials to the game laws and suggested that "the interests of the people must be paramount and that the conventional attitude as regards game preservation requires revisions." 17 In particular, agricultural and veterinary officers thought that nature preservation efforts lacked discrimination and too often had the effect of impoverishing rural areas. A resolution passed at a 1926 agricultural conference stated: "[I]n Tanganyika ... indiscriminate game preservation ... had the effect of so segregating natives that their land was becoming exhausted, and a condition was arising leading to their demoralisation and preventing their natural increase." 18 The observation is an amazingly prophetic statement about the conditions surrounding protected areas on the eve of the twenty-first century. Such opinions and debates indicate how dangerously ambiguous the various land and natural resource laws were. An untenable situation existed in which African rights seemed to be simultaneously eliminated and protected. A district administrator, for instance, argued that the Game Ordinance opposed the Land Ordinance and Territorial Mandate because it "must necessarily interfere with the holding, use, occupation and enjoyment of lands by natives and must necessarily disregard the rights and interests of natives." 26 These contradictions are representative of a pattern in the colonial state's approach to land and resources laws. In asserting its political dominance, sweeping claims to the ownership of all land and resources would be made and then the "privilege" to continue some customary uses would be granted. The character of these privileges was shaped by the colonial political economy as well as European ideologies of nature, hunting, and scientific resource management. Both of these factors will be explored below. Some colonial officials, such as the "pro-African" administrator Sir Philip Mitchell (later governor of Kenya) and his onetime protégé in Tanganyika's Northern Province, A. E. Kitching, seemed sincerely concerned with protecting customary rights against the onslaught of European conservation efforts. Kitching's articulate and impassioned counterattacks on forestry and wildlife officials in defense of African rights appear in the records repeatedly, sometimes as a lone voice. Many of Kitching's critiques were carefully reasoned legal arguments based on existing laws. Other administrators chose to argue from a moral stance. "Are we justified," asked an official, "in treating a man who, following the customs of his ancestors, keeps a bee-hive in the forest without a license or searches for wild honey as a criminal who may be sent to gaol for six months?" 27 Moral appeals and outspoken advocates like Kitching were rare, however, and the harsh political-economic realities of administering an insignificant colony such as Tanganyika go further in explaining the government's reluctance to extinguish African rights than some model of imperial benevolence. Arusha National Park in northern Tanzania, known for its scenic beauty, is also a battleground. Roderick Neumann's illuminating analysis shows how this park embodies all the political-ecological dilemmas facing protected areas throughout Africa. The roots of the ongoing struggle between the park on Mount Meru and the neighboring Meru peasant communities go much deeper, in Neumann's view, than the issues of poverty, population growth, and ignorance usually cited. These conflicts reflect differences that go back to the beginning of colonial rule. 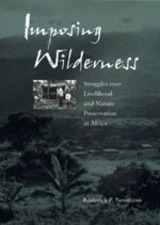 By imposing a European ideal of pristine wilderness, Neumann says, the establishment of national parks and protected areas displaced African meanings as well as material access to the land. He focuses on the symbolic importance of natural landscapes among various social groups in this setting and how it relates to conflicts between peasant communities and the state. Roderick P. Neumann is Associate Professor in the International Relations Department at Florida International University.